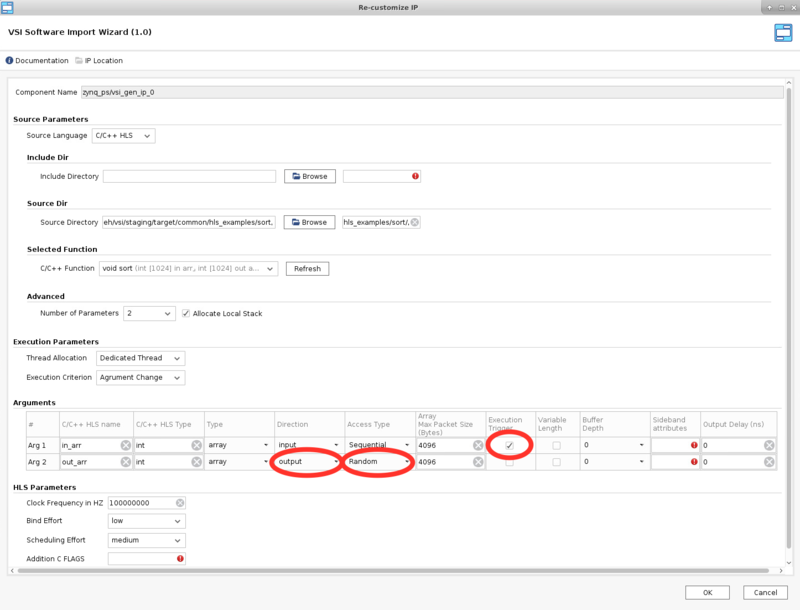 VSI software import Wizard, allows users to import C/C++ functions into the VSI dataflow environment. The user can specify multiple source directories, a built-in C/C++ parser will parse all source files in these directories and create a list of functions the user can choose from. Once the user chooses the function associated with the block, the wizard will prefill most of the information “Arguments” section. 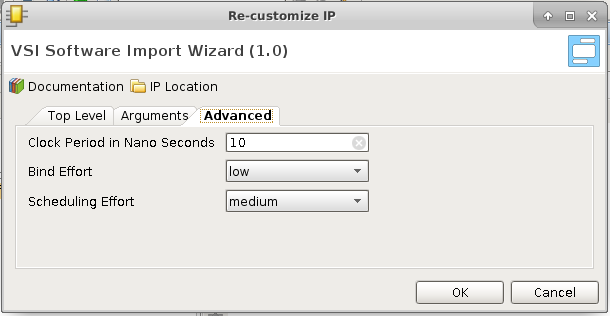 Figure below shows the screen shot of the Software Import Wizard. The following sections will describe the wizard and each field in greater detail. vsi::runtime will execute a function if any input argument marked as “trigger” changes. The runtime can also execute a block based on a timer by choosing “Timer Expiry”. The runtime will create a timer which will execute the function every “Execution Timer” nano-seconds. The runtime will keep track of the amount of time spent by the function itself and will adjust the timer to make sure the function is executed as close to the “Execution Timer” value as possible. This field is automatically updated when the function is picked in the “Top Level Tab” and is the name of the argument. This filed is automatically updated when the function is picked in the “Top Level Tab” and is the type of the argument. The two type hls::stream and vsi::device have special handling. The function is executed whenever data arrives on this “Input” interface. See “Type” dropdown list for more details. Software Context : This is used only when the direction is Input and Type is an Array. Hardware Context: This is used only when the direction is Input and Access Type is Sequential. This field is auto filled when the function is picked in the “Top Level Tab” and represents the size of the buffer that will be allocated in the wrapper function for this argument. For “Pointer” type this field is initialized to -1, since the compiler cannot determine the amount of storage to allocate for this argument. It is important to specify the maximum size of the buffer to be allocated, for “pointers” this value will be used to allocate dynamic storage in the runtime, a value of -1 will cause a runtime failure. This field is not used when the “Type” is “Reference”. This field is used when the block is placed in the Hardware Context and the access type is “Sequential”. The VSI System Compiler will generate a FIFO of the given depth for each of the interfaces that has value > 0 associated with it.